If you want a lot more monsters and giant robots duking it out in the future, you may very well get your wish. Pacific Rim Uprising is set to debut in theaters in March, which serves as a follow-up to Guillermo Del Toro's first giant robot flick. Now Pacifc Rim 2 director, Steven S. DeKnight (Daredevil) reveals that, if the sequel does well enough at the box office, we could see a Pacific Rim cinematic universe take shape. During New York Comic Con, the first trailer for Pacific Rim: Uprising debuted and, for the most part, it looks to be more of the same. How many times can you make giant robots fighting giant aliens exciting? Steven S. DeKnight spoke with Nerdist during NYCC and, according to him, they've already discussed a third movie and potential spin-offs. 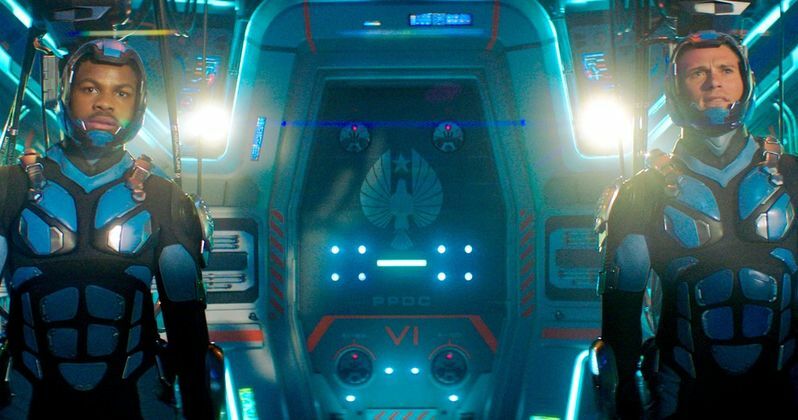 So, apparently, the Pacific Rim universe could somehow be rich with stories. Here's what he had to say about it. "I'm certainly hoping so. I think you'll definitely probably get more comics. The plan was always to use this movie as a launching pad. If enough people show up to this, we've already talked about the plot of the third movie, and how the end of the third movie would expand the universe to a Star Wars/Star Trek-style [franchise] where you can go in many, many different directions. You can go main canon, you can go spin-offs, you can go one-offs. Yeah, that's the plan. And I would love to see an animated TV show based on this." The idea of doing comic books or even an animated series, which was rumored to be happening at one point, set in the Pacific Rim universe, makes total sense. That's something die-hard fans could seek out, without the studio expecting moviegoers to shell out box office dollars for a very expensive, blockbuster movie. However, the idea of expanding this out like Star Wars or Star Trek and doing a ton of Pacific Rim movies as part of its own universe? That's a very big idea, to say the least. And as of right now, there isn't a lot of evidence that suggests there's enough of an appetite for such a thing. The first Pacific Rim did well at the box office, bringing in $411 million worldwide, but it had an absolutely monstrous production budget, which makes that number much less profitable. Pacific Rim: Uprising is another very expensive, blockbuster movie that will need to make at least that much in order to justify a third movie, let alone a cinematic universe. Universal's Dark Universe may be in trouble with The Mummy bringing in roughly the same amount of money this year. However, the big difference here is that audiences really liked Pacific Rim, it just didn't do as well as the studio had hoped. Pacific Rim: Uprising is set for release on March 23, 2018. That puts it in prime position to rake in the money at the box office, assuming the movie is good. If it does, these comments to Nerdist from Steven S. DeKnight make it seem like the studio may start greenlighting Pacific Rim projects left and right.